Lay out a sheet of puff pastry. Leaving a 1/2 gap on one end, top the pastry with half of the cheese, half of the thyme and Cattleman’s Grill Italiano Seasoning. Then layer on the ham. Wet the gap of exposed pastry with a little water. Begin rolling the pastry into a log, starting at the side opposite the exposed pastry. Finish rolling the log and place on a sheet pan, seam side down. Refrigerate for one hour to allow the pastry to become firm. Preheat your Yoder Smokers YS640 to 425ºF. Remove the log from the refrigerator and slice the into 1/2 inch discs. Lay the discs flat on a parchment paper lined sheet pan. Bake until the puff is golden brown on bottom, about 20 minutes. 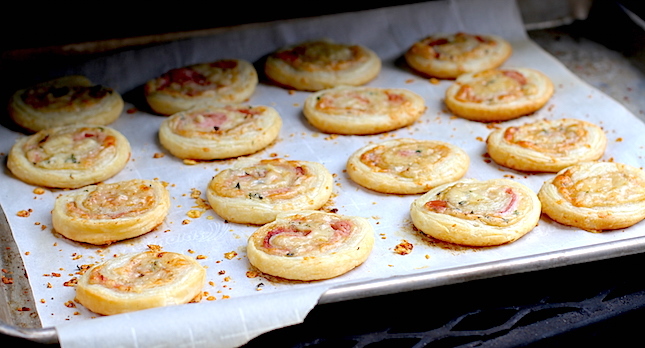 Puff pastry is a great food item to have in your freezer at all times. It’s super versatile! It can be used for sweet or savory applications. It’s great for desserts or appetizers and people love this stuff! 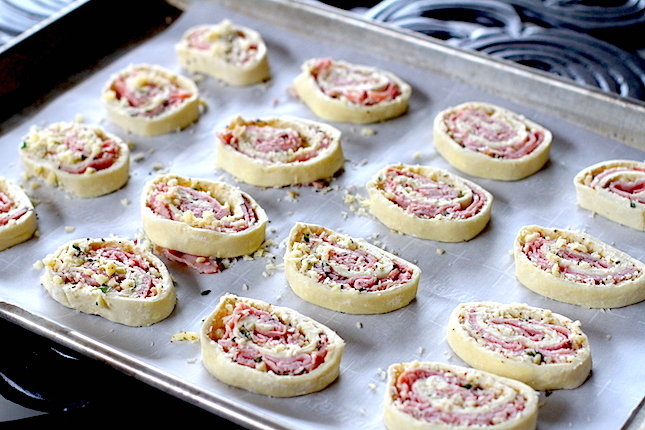 These ham & cheese puff pinwheels are both visually interesting and super tasty, which makes them great for parties or big dinners. Don’t skip the fresh thyme! Thyme pairs great with ham (all pork, really). And make sure it’s the fresh stuff, not the dried. You only want the leaves, so holding the stem in one hand, pinch your pointer finger and thumb of the opposite hand around the stem and slide your fingers along the stem, stripping the leaves away.